Shower Craft Perth has experience in the tile and waterproofing industry spanning 28 years and the company currently services and advises some of Perth’s largest building companies as well as real estate, domestic and commercial housing. 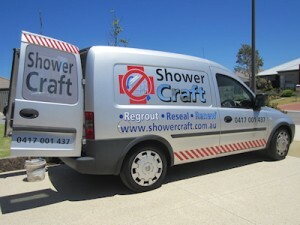 Shower Craft Perth have a refreshing back to basics trade approach to this ever frustrating problem of leaking showers. With the development of specific shower craft tooling and advancing basic materials some builders have described, Shower Craft as the “industry experts” in this area of shower repair. There are no patch up solutions. There can be no part sections of grout removed or “filling in the holes that are visible. No magic sprays or paint brush cover-ups. No spreading over – or topping up of existing wall and floor grouts with “special” grouts or epoxy fillers. All of the grout joints in the “leak zone” must be recut and replaced. Making this the Shower Craft difference. The standard grouts available can be somewhat inadequate in your shower area. When you consider the punishment they go through with soaps, detergents and harsh chemical cleaners. There are several grades of grouts, each with their individual benefits for various applications. Shower Craft blend two grades of grout to achieve the benefits and features of both. Together with a formula of additives from the grout and adhesive industry, we believe we have grouts unmatched for their sheer strength, flexibility, hardness and adhesion. With the ability to be colour fast – unlike all blends of epoxy and “cover up” vaniers. On site colour matched and blended standard and super flexible grout plus our own formulated additives making Shower Craft regrouting impregnable with superior mould and chemical stain resistance.